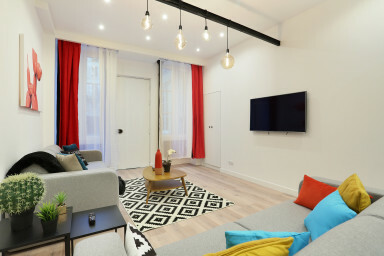 Amazing & modern 145sqm 3 bedroom / 4 bathroom apt on rue du Faubourg St-Martin, in the higher Marais, close to Republique and the Canal Saint Martin. The apt has been entirely refurbished with quality equipment & beddings, modern bathrooms and nice volumes. It also has an amazing movie and game room (ping pong & baby-foot) in the basement. Fully equipped with 3 queen size beds and 3 comfortable sofa beds, Wi-Fi, TV, hair dryers, iron, linen and towels provided. Perfect for friends & family!